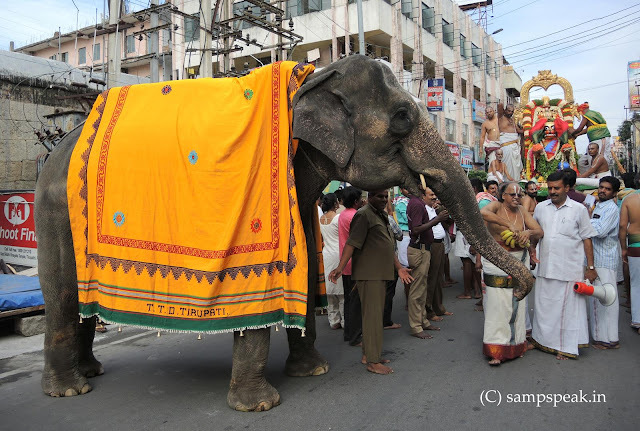 "Sampath Speaking" - the thoughts of an Insurer from Thiruvallikkeni: majestic elephant ~ language problem !! Language is the means of communication ! ~ often people get angry and confront other because of miscommunication, unwillingness to negotiate and be reasonable in solutions .. .. often people who do not know, understand or are not part of the problem suggest answers from outside leading to more trouble .. .. there are subtle issues understood only by those involved in it ~ the first solution is to keep outsiders at bay !! when there is trouble – only experienced and matured elders should speak and all others should respect their wisdom .. Sad are ways of people !! U.S. prosecutors have indicted the owner of a South African hunting company, accusing him of bribing Zimbabwean officials while guiding a Colorado tourist and working to have the ivory tusks of an elephant that the group illegally killed inside a national park imported to the United States. Prosecutors in Colorado said Hanno van Rensburg took a hunting party to the area around Gonarezhou National Park in Zimbabwe to hunt elephants in 2015. The Colorado client shot one elephant that did not die. The group then tracked the animal into the national park but could not find it, according to prosecutors. An indictment unsealed last week said van Rensburg and the hunter bribed government officials with at least $5,000 to let the party shoot other elephants inside the park. Zimbabwean law does not allow hunters tracking a wounded animal inside the park to hunt other wildlife. Elephants ~ I simply love them, starting from the days of my calf-love with Azhwan, that majestic elephant of Sri Parthasarathi temple ! ~ elephant in the room is an metaphorical idiom for an obvious problem or risk that no one wants to discuss. It is based on the notion that something as conspicuous as an elephant can appear to be overlooked in codified social interactions. In 1814, Ivan Andreevich Krylov, poet and fabulist, wrote a fable entitled "The Inquisitive Man" which tells of a man who goes to a museum and notices all sorts of tiny things, but fails to notice an elephant. The phrase became proverbial. Elephants are intelligent, they can remember and have the ability to understand human body language. Authorities at Dudhwa Tiger Reserve (DTR) are banking on just that to break the Kannada–Hindi language barrier and help the 10 jumbos which have come from Karnataka to become a part of the reserve’s patrol force. When DTR authorities worked out plans to transport 10 elephants from Karnataka, they were aware that these jumbos would respond only to commands given in Kannada. But jumbos’ new handlers would speak in Hindi. To surmount the language problem, six mahouts of Dudhwa were sent to Karnataka for a two-month training before shifting the jumbos across 2,500km to DTR by road. Kartick Satyanarayan, co-founder and CEO, Wildlife SOS, said, “Elephants are intelligent mammals and learn quickly. They understand the expectations and behaviour of their mahouts.’’ Of the 12 mahouts who came from Karnataka, five would be leaving for home this week while the others would be going in 10 days. “The mahouts of Karnataka stay at a distance from elephants so that the jumbos are detached from them,’’ said a forest official. He added that once the four-month quarantine period is over and the elephants get used to their new home, a health check-up would be conducted and then they would be made to meet and interact with the 13 resident elephants of Dudhwa. Before you jump into your stake on ‘language problem’ and thought of saying “hello” like an elephant, now you can !! For the first time, human words and emotions are being translated into elephant calls that signal similar emotions or intentions, also dubbed “elephant language,” thanks to a new website translator. Developed by the David Sheldrick Wildlife Trust and ElephantVoices, the Hello in Elephant website allows people to send messages to friends, translating human phrases into elephant calls. By inputting a phrase by voice, text, or emoji, users can see a video of an elephant communicating the same greeting or emotion back to them, which can then be shared with others. By typing “hello,” for example, the translation includes an elephant call used to greet one another. Saying “I love you” or “xoxo” will play an elephant call used to express love or affection. The new website—which launches just in time for World Elephant Day on Aug. 12—was created to help raise awareness of the elephants’ plight. Elephants continue to be in danger of extinction due to poaching and habitat loss. There were over 10 million African elephants in the early 20th century, but it’s estimated that there are now less than 400,000, according to the Great Elephant Census. By 2025, scientists predict there could be only 190,000 African elephants left ~ and it the very same people who cry hoarse of elephants being treated badly in India, Srilanka, Thailand and more ~ secure licence to kill the mammoth jumbo with powerful rifles and bullets. Strange are the ways of the people !